Landscape estate agent flag boards, these side fixing estate agent boards that are wider than they are tall, are printed directly on to both sides of a 6mm 1400gsm estate agent board material, using the latest digital machines in 1 colour to full colour including photographs all for just £6.20 each + VAT. 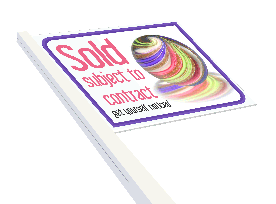 Estate agent flag boards, are generally used for marketing terraced houses, placed normally at second floor level, mounted to a batten which is attached to the wall, or within window reveals. They are also favored by rural estate agents, where space isn’t an issue. Once mounted in a slotted post at one edge, a landscape estate agent board needs some 800mm plus of space, in our opinion the 6mm estate agent board is the strongest option, when space isn’t an issue. Just Print are utilising the latest in digital print technology to help you to conserve your precious cash flow in these difficult trading times by reducing the number of estate agent sign boards you order at a time – without paying silly prices! whether they are printed one side or two; or even if you want to order just 1 estate agent sign or 100…. the price you pay is just £5.95 +vat per estate agent board. Our estate agent sign boards are manufactured by us from 6mm 1400gsm UV stabilised sheet, and Sold by us at the same price (or less) that others charge for 4.5mm 1050gsm estate agent signs or even 4mm 700gsm signs. Of course, we can produce many other size/colour combinations of estate agent boards. If your requirements are not listed, Please just ask! We can also supply Commercial estate agent boards, estate agent T-boards and site signs please phone for prices. These estate agent boards really do stand up to the elements! The photo below is a genuine example of how our board compares to a competitors. Which do you think would stand up better to a strong wind or gale ?